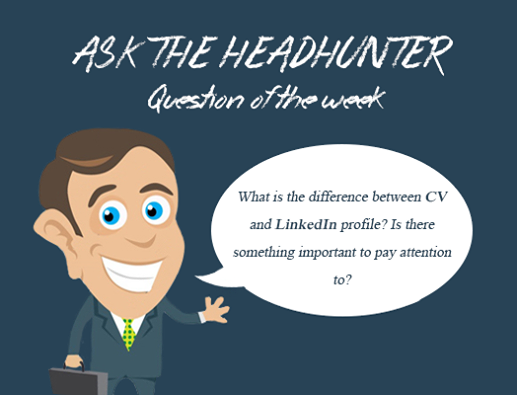 A few months ago I was discussing this issue with a colleague — exactly what is or should be the difference between your CV and your LinkedIn Profile. Your CV is and should be a complete list of your working career, giving the reader overview of your experience & other qualifications. This is the document that you are providing that fully represents “you”. LinkedIn on the other hand, is a business social media site that is also used to professionally present you by giving the reader an overview of your professional experience, but can also have some difference & the possibility for quite a bit more information than you could realistically have on your CV. I usually explain to candidates that in today’s world it is absolutely essential to have an up-to-date online presence. As such, with regards to LinkedIn specifically, I don’t believe it is always necessary to have your complete working history listed going all the way back to your earliest positions, but you should never lie about a position you held or the time you were in that position. Always be sure that what you are presenting on LinkedIn (or other similar social media platform) is never in conflict with what your CV says. With that said, I think your goal with social media sites such as LinkedIn is to give the reader the overview of “who” you are but also with the possibility of providing more depth – done through how you layout the information or even with the many additional information options you have available to provide the reader (groups you are member of, volunteer positions, etc.). As with your social media presence, your CV should also be updated regularly – and that also means keeping up to date with what is acceptable in the way of layout, information needed, etc. The general CV style from 10 years ago is different from what is expected today. Being sure that you follow what is “trending”, desired or required, is essential to your being as sure as possible that your message is being delivered to the intended target (your CV is read).